Work is ongoing at Peterborough Cathedral to conserve and remodel two listed buildings so they can, for the first time, be opened to the public. A finishing date sometime this summer is the hope for the cathedral’s Heritage and Education Centre which will provide a welcoming space for visitors where they can view dynamic displays (including an interactive touch-table) and find out more about the cathedral’s fascinating life and history. 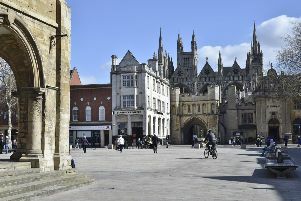 The centre in the Cathedral Precincts will have special facilities for hosting school groups, a small temporary exhibition room and an historic space in the Knights’ Chamber for hosting talks, concerts and other events. The buildings are now coming to the close of the construction phase. Once this phase is complete, attention will turn to completing and installing the displays and furnishings. The new centre is part of a £4 million project to improve access to the cathedral.